Looking Past the GHOSTS & ASHES–Review and Giveaway! Hi there! Today I’m sharing a review and giveaway for a new M/M YA Sci-Fi adventure from F. T. Lukens. 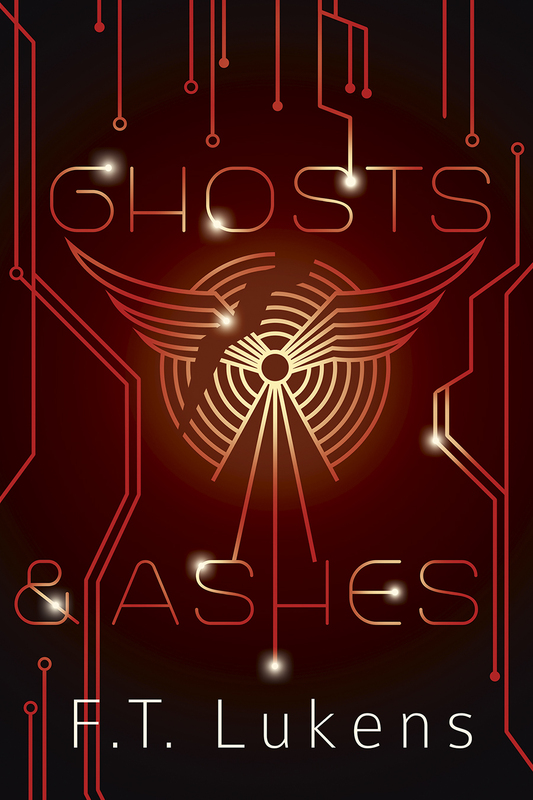 GHOSTS & ASHES is the sequel to the phenomenal THE STAR HOST, and should be read in order. This space opera features a technopathic boy trying to find his family a year after he’d been captured, tortured and escaped–and the military recruit who will sacrifice anything to keep him safe. Catch an excerpt below and register to win a $25 GC or one of five ebooks. This is the second book in a series and best enjoyed when read in order. Ren is a star host, a person who can control technology using his mind. He has the ability to mentally fuse with any electrical gadget, no matter how big or small, and can fix most any broken appliance with a touch. In the first book, he had been captured and tortured for this ability, as Baron Vos sought to bend Ren to his control as a weapon. Ren joined with Asher, a captive member of Phoenix Corps–a form of galactic police–and they escaped the Baron’s fortress. That was just the beginning of their saga, which I’ve described in my review. Now, however, Ren adn Asher are struggling yet again. Phoenix Corps are directly monitoring Ren’s mental and emotional state with daily reports to assess if he’s a threat. Star hosts are notorious for bonding with their machines and losing humanity altogether. It’s not been easy for Ren to stay in his body when the Star Stream, his host ship, is calling out for his loving touch. Asher has pulled away, Ren believes, and Ren can’t sleep or eat. He’s on the verge of cracking when Asher confesses Ren’s instability and urges hsi commanding officer to allow Ren to return to his home planet to get a break from teh tech surrounding him. THis is Ren’s deepest wish, too. TO investigate the fate of his parents and brother–lost to him a year ago when he was captured. Life on Erden isn’t what it had been. Ren’s humble village had been destroyed–by the Phoenix Corps, searching for Ren and other star hosts. It’s only one stage in a centuries-long battle Ren soon learns. And it makes him even more frustrated with Asher’s devotion to their service. Still, being on the planet does help Ren return to his humanity–though it’s short-lived. Ren’s mission to find his missing brother, Liam, brings them right into Phoenix Corps deadly sights, and their quest reunites Ren and Asher with their previous captors. Only this time, Baron Vos isn’t the only enemy to fear. The pace of the story is excellent. Ren’s confusion and struggle to remain human is easy to understand. His hurt over Asher’s decisions, and coldness, is palpable. Their trust has been broken, but they still need to rely on one another to survive each challenge–and it gets really challenging. The sci-fi elements are engaging and accessible, even for people who don’t enjoy sci-fi, per se. Asher and Ren are a couple, to a degree, and there is a little bit of kissing and connection, but nothing to even blush over. This book is all about the action, and Ren’s quest to live as normal a life as possible as a star host. He’s convinced his brother is being held captive–confirmed by telepathic communication–and Ren is going to rescue Liam no matter what. Even if Asher stands against him. That’s an admirable stand, and Ren’s an admirable young man. Asher’s motives are often int he shadows, but his intent is to protect Ren, even from Ren’s instincts. The conflict is high, and the stakes are life/death/freedom, so it’s pretty intense. Do not expect this story to end with this book. We are on a long story arc that leads Ren on many adventures. I liked where this ended, and I’m anxious to get the next book in the series. Highly recommend to folks who like sci-fi, and readers who want diverse characters. Interested? You can find GHOSTS & ASHES on Goodreads, Goodreads, Interlude Press, Amazon, Barnes & Noble, Smashwords, iBooks, Kobo, Book Depository, IndieBound and Google Play. Click on this Rafflecopter giveaway link for your chance to win a $25 GC from Interlude Press or an ebook of GHOSTS & ASHES.